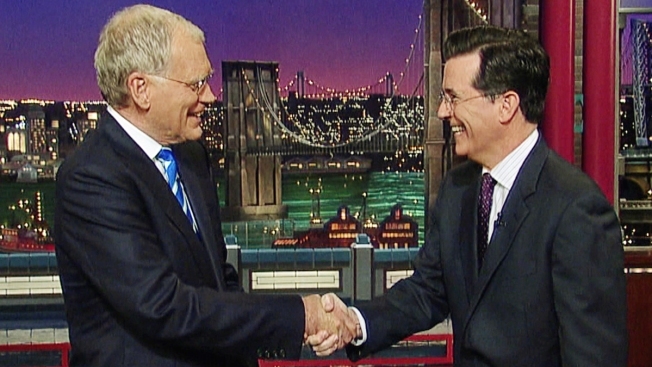 Stars, Fans React to Stephen Colbert Taking Over "Late Show"
In this file photo, David Letterman, left, welcomes fellow talk show host Stephen Colbert. As news broke that Comedy Central star Stephen Colbert will take over the "The Late Show" when David Letterman steps down in 2015, celebrities, fans and fellow comedians took to social media to voice their reactions. "Tonight Show" host Jimmy Fallon congratulated Colbert, saying in a Twitter message, "I'd like to welcome the great @StephenAtHome to network late night and also congratulate him on his new name: Jimmy Colbert." Jimmy Kimmel, the host of "Jimmy Kimmel Live!" tweeted: "Congratulations to @StephenAtHome #StephenColbert - a finer or funnier man I do not know." Colbert, 49, said in a statement: "Simply being a guest on David Letterman's show has been a highlight of my career. I never dreamed that I would follow in his footsteps, though everyone in late night follows Dave's lead. ... Now, if you'll excuse me, I have to go grind a gap in my front teeth."